If you’re looking for autumn flower inspiration, I can tell you, you’re in the right place. You can see some shots from our recent autumn elopement inspiration shoot here on the blog which was featured last week on Ruffled Blog. 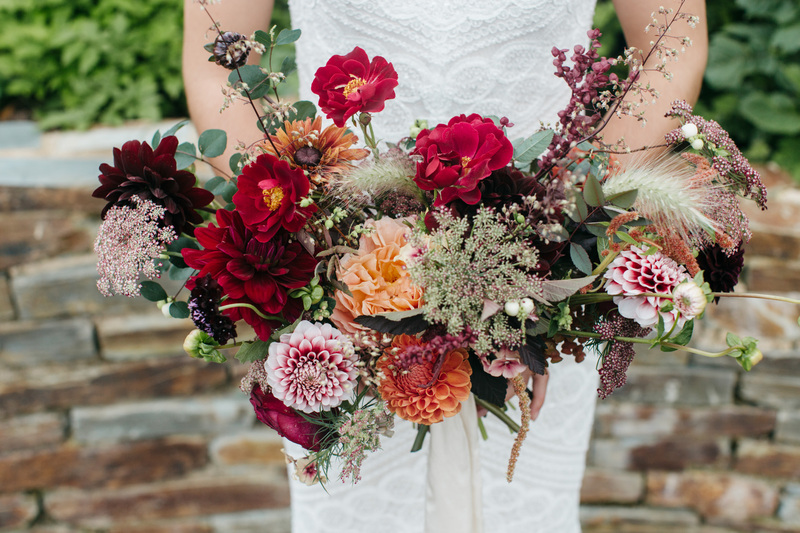 Photographer Emma Barrow put together a great team of wedding professionals who brought their best game to the shoot and created a mouth-watering, berry crush of autumn loveliness. Holly Bee used dahlias, roses, chocolate cosmos (that really smells of chocolate!) and gorgeous creme brulee phlox from her own garden mixed with moody copper beech stems and grasses to create this arrangement for the ceremony backdrop. The personalised ceremony backdrop was designed by Nikki of Knots & Kisses, a wedding stationer who has now expanded into wedding styling. Holly also created the beautiful bridal bouquet which had pops of orange and sunset colours to bring light to the arrangement. The centrepiece for the tablescape was a sumptuous arrangement reflecting the abundance of autumn. Nikki set the table with autumn fruit and pears which she had gilded at home for the place names. I’ll come back and talk about the table deets in another post – this one is all about the flowers! Small bud vases with single stems ensured the flower were reflected in little spaces throughout the shoot to add echoing touches. I just love these velvety wine coloured roses with their powdery ochre stamens – so strokable! Don’t these flowers have such mouth watering names, cafe au lait, chocolate cosmos, phlox creme brulee…? That might explain why I just wanted to gorge on some of these beauties (was that just me? Uh, ok). There’s still plenty to show and tell about this shoot so look out for the next installment. If you’re thinking of an elopement wedding, pop over to our elopement page and download our elopement brochure.